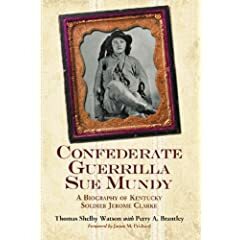 Confederate Guerrilla Sue Mundy: A Biography of Kentucky Soldier Jerome Clarke by Thomas Shelby Watson and Perry A. Brantley (McFarland, 2007). As the table of contents reveals, this book is also a much broader look at guerrilla warfare in Kentucky. Mundy is an interesting fictional persona. Not surprisingly, much like those that claim to this day that Bloody Bill and Jesse James did not meet their ends in the manner accepted by history, there are those that insist Mundy was indeed a guerrilla of the XY variety. Huts and History: The Historical Archaeology of Military Encampment During the American Civil War edited by Clarence R. Geier, David G. Orr, and Matthew B. Reeves (University Press of Florida, 2006). I reviewed another archaeology book from this press (also edited by Geier) last year [link]. This one looks just as excellent. How the South Could Have Won the Civil War: The Fatal Errors That Led to Confederate Defeat by Bevin Alexander (Crown, 2007). This Republic of Suffering: Death and the American Civil War by Drew Gilpin Faust (Knopf, 2008). The popular interest in this title comes as a bit of surprise (doubtless the author's recent high profile ascension to the presidency of Harvard has something to do with it -- but maybe it stems from a bargain with a certain M.). I haven't read any of Faust's previous book length studies (just a number of articles), but a skimming of some of the reviews of this title has piqued my curiosity. First Manassas Battlefield Map Study by Ed Bearss (H.E. Howard, 2nd Ed., orig. 1991). FBR is one of my favorite battles to keep up with, so I figured I should finally get my own new copy of this classic before it goes completely out-of-print. Harry would be proud. Denny & Bradbury: "The Civil War's First Blood"
While the subtitle implies a broader focus, The Civil War's First Blood is really the first modern work that attempts a complete overview of Missouri in 1861, the most critical year of the state's Civil War experience on many levels. Even though only a few pages were devoted to the violent and politically charged years leading up to secession and Civil War, the omission becomes less significant with the realization that the period is already ably covered in the literature. On a similar note, it might also be admitted that the major military events of 1861 are fairly well documented in the literature as well, but no previous effort has synthesized the best of this current scholarship into the formation of a single work covering the entire state. With their book The Civil War's First Blood, authors Denny and Bradbury have performed this needed labor to a satisfying end. State historian James Denny and manuscript specialist John Bradbury write well and their bibliography lists the best of up-to-date scholarship contained in books and articles. The narrative is well balanced, and augmented by a nice array of color and B&W drawings, maps, and photographs. Expertise is demonstrated in their selection (some of which, as far as I can tell, were published here for the first time). Of special note to this reviewer is an impressive wide-view photograph of state militia drilling at Lindell Grove (Camp Jackson) [pp. 20-21]. Although a few more were needed, the maps included in the book, both original creations and archival reproductions, are attractive and helpful visual aids. Perhaps not surprisingly, The Civil War's First Blood is presented by Missouri Life with a magazine's sensibility--that of heavily illustrated text written in a pleasing narrative style (e.g. without notes) on glossy paper. Even with the popular focus, I was impressed by the level of detail accorded the military summaries. Their depth far exceeds that commonly found in other works of this type. My only complaint relevant to coverage is with the book's comparative neglect of the northwest quadrant of the state. 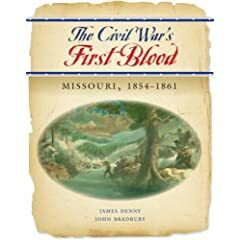 Denny and Bradbury's excellent narrative history of the opening moments of the Civil War in Missouri (the period before guerrilla warfare became the center of attention--then and now) is highly recommended. Expanding upon their role as chroniclers, the authors' engagement in the analysis of events is both astute and refreshingly evenhanded. New readers and well read students alike will find much to appreciate in The Civil War's First Blood. "The Maps of Gettysburg: The Gettysburg Campaign, June 3 - July 13, 1863"
I rarely find myself in line to pick up the latest book covering this minor Pennsylvania pillow fight, but I simply cannot pass up any map study. Happily, the cartography frequent Gettysburg author Bradley Gottfried created for his book The Maps of Gettysburg: The Gettysburg Campaign, June 3 - July 13, 1863 (Savas Beatie, 2007) doesn't disappoint. With some caveats, the battle maps are a shining model for other authors and publishers to follow. Drawn at regimental scale, with an impressive collection of terrain detail work (to include contours, vegetation type, roads, trails, fence lines, streams, crop types, etc. ), the reader is treated to a visual feast of unusual generosity. Another great feature are the detailed tactical representations of the fighting at the Battle of Second Winchester and nearby action at Stephenson's Depot, both of which have few good examples existing in the literature. Finished off with nice full cloth binding, it's a nice production, with a heft as substantial as the information contained inside. Gottfried's study pairs a page-sized map on the right side, with a full page of explanatory text on the left. As a system it works well. My only significant complaint is with the lack of a clearly declared time element attached to each map. Uncertainty of the timing of chaotic historical events is a given, but the inclusion of an estimated range based on the best available source information would have been very helpful. This beef aside, Gottfried's study is a very impressive map collection. One can only hope that this is the beginning of a series...in fact, rumblings of a Chickamauga project from highly regarded expert Dave Powell have been heard. Thunder Across the Swamp: The Fight for the Lower Mississippi, February 1863–May 1863. Blood on the Bayou: The Campaigns of Tom Green's Texans, June 1863–February 1864. Death at the Landing: The Contest for the Red River and the Collapse of Confederate Louisiana, March 1864–June 1865. Frazier is a great researcher and writer (and a fine cartographer I might add). I can't think of anyone better equipped to undertake such a monumental project. Perhaps more than one Pate Award lies in there. Kionka: "Key Command: Ulysses S. Grant's District of Cairo"
Most Civil War readers are aware of Ulysses S. Grant’s early war association with Cairo, the muddy, sickly but strategically important Illinois town located at the confluence of the Ohio and Mississippi rivers. Arriving in September 1861 and making his headquarters in the city, Grant commanded the District of Southeast Missouri (later redesignated the District of Cairo). Military highlights of his district command include the seizure of Paducah and Smithfield (KY), the Belmont campaign, and the launching of the twin river offensives in early 1862 against Forts Henry and Donelson. These events are well documented, but what Civil War historiography has previously lacked is a comprehensive history of Cairo itself and its wartime role. Author T.K. Kionka’s Key Command helps fill this void and is the first book length study of Civil War Cairo. Early chapters trace the town’s history from its inception through to the arrival of the Cairo Expedition. These Chicago troops preceded Grant’s arrival by six months, erecting camps and hospitals, along with earthworks and batteries for the town’s defense. In her analysis of Grant’s achievements, Kionka is effusive in her praise of both Grant’s character and his organizational/military talents. One of the book’s main themes appears to be Cairo’s crucial role in Grant’s command education and as a predictor of the general’s later success. She makes a strong case in this regard. According to Kionka, Grant deserves much of the credit for staffing and organizing the district hospitals. Similarly, the general’s organizational skills streamlined supply acquisitions and, along with his essential honesty, helped root out massive fraud and waste in government contracts. The author also praises Grant’s development of a humane and efficient plan for devising gainful employment for the thousands of freedmen pouring into the general’s area of command responsibility later in the war. Unfortunately, what Key Command lacks is balance in both content and source material. An examination of the bibliography finds only newspapers located in northern states listed and no manuscript collections outside the state of Illinois were consulted. Although not problematic in some areas, this lack of assembling a broader body of source material becomes especially troublesome in Kionka’s assessment of military events. Grant’s near disastrous Belmont campaign is uncritically accepted as a Union victory. Furthermore, the author’s characterization of Confederate and regional pro-Southern forces is often regrettable. For instance, Kionka writes “Grant stated that the notorious Jeff Thompson murdered loyal Missourians and brutally butchered their bodies” (pg. 147). M. Jeff Thompson was certainly not known for murdering civilians and there is no evidence for this charge, yet the statement is accepted without qualification. All too often, little nuance is employed in applying labels to individuals and groups from both sides. As examples, pro-secessionists are often called “terrorists” (and nowhere is it made clear that both sides were guilty of committing similar atrocities) without specifying acts committed, and Union officer John A. Logan is labeled a “traitor” at various places in the text. Flaws aside, Key Command is a useful social and economic history of wartime Cairo. Readers wishing to learn more about the societal complexities of the “Egypt” region of Illinois and those wanting to know more about General Grant beyond his military exploits will find this study of interest. 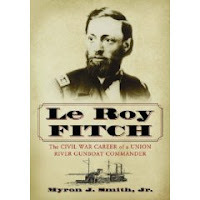 Le Roy Fitch: The Civil War Career of a Union River Gunboat Commander by Myron J. Smith, Jr. (McFarland, 2007). I enjoyed Mr. Smith's Fitch article from the current issue of North & South magazine (10:4), and am pleased to have received his book length treatment of that officer's career. It looks impressively detailed, far far more than the typical work of this sort. Small Arms at Gettysburg: Infantry and Cavalry Weapons in America's Greatest Battle by Joseph G. Bilby (Westholme, 2007). I've also been meaning to read Bilby's other recent work, A Revolution in Arms: A History of the First Repeating Rifles , but have yet to obtain a copy. This book appears to examine the tactical use, effectiveness, etc. of certain weapons through the lens of specific historical scenarios from the Battle of Gettysburg. An interesting concept, if my characterization is accurate. Hurst's Wurst: Colonel Fielding Hurst and the Sixth Tennessee Cavalry U.S.A. by Kevin D. McCann (McCann Publications, 4th ed., 2007). Modern regimental histories of Tennessee (U.S.) units are rare (I can't think of any other recent examples). Overall, those raised in the western part of the state have received far less attention than their East Tennessee comrades, and this attractive self-publishing effort looks to contain some useful information. War Stories: The Civil War in West Virginia ed. by David Phillips (Gauley Mount Press, 1991-OP). This looks like a collection of articles, diary entries, letters, etc. ; cursorily indexed but unfortunately not annotated. The Iowa Northern Border Brigade by Marshall McKusick (Iowa: Office of the State Archaeologist, 1975-OP). This unit was an Iowa militia organization formed in response to the 1862 Sioux uprising in Minnesota. If no one else, I would venture to guess that fellow blogger Dave Woodbury would be interested in this one. Sixty-Six Miles in Thirty-Nine Hours: The Retreat from Fort Davidson, Pilot Knob to the Battle of Leasburg by Gary Scheel (Scheel, 2002). This is one of those spiral bound, self-publishing efforts that one is ordinarily wary of. On the face of it, it does have some good things going for it. The narrative is annotated and appears largely based on first person accounts. It also includes a Union casualty list for the Pilot Knob to Leasburg phase of the Price Raid. Scheel has also written a regimental history of the 31st Missouri titled Rain, Mud & Swamps . The Fort Branch Battlefield Commission has published a pair of monographs, the sales of which benefit the Fort Branch site preservation. Martin County During the Civil War by James H. McCallum, M.D. and Fort Branch And The Defense Of the Roanoke Valley 1862 - 1865 by Phillip Shiman look to be of value, and are very reasonably priced to boot (esp. when purchased together). The latter is a brief military summary of the fort's history that also offers a number of maps and illustrations (incl. a highly detailed pull-out historical map of the surrounding area). Pickenpaugh: "Camp Chase and the Evolution of Union Prison Policy"
A number of northern POW camps have been the focus of detailed studies over the past decade; however, Roger Pickenpaugh's Camp Chase and the Evolution of Union Prison Policy is the first modern history of Columbus, Ohio's Camp Chase. The place certainly is a fine candidate for a case study examining the often haphazard, multi-purpose uses concocted for these camps. Beginning life as a training depot, Camp Chase evolved and expanded into both a parole camp for Union soldiers and a detention facility for Confederate POWs, frequently at the same time. Political prisoners were also frequently housed at the site. Undoubtedly, the subject of the degree of deliberate abuse perpetrated inside POW camps run by both sides remains a hot button topic in the literature. Pickenpaugh largely avoids this 'race to the bottom' debate, discussing these issues rather briefly, albeit in a confident and deliberate, evenhanded fashion that appears to reinforce much of the findings of current scholarship [at least that's my impression from my own limited reading dealing with prisons, mainly gleaned from scholarly articles and book reviews]. However, I would liked to have seen some quantitative analysis of POW deaths included in this volume. A sickness and/or death rate comparison with that of the parolees might also make for a useful future study, especially with both groups having cited similarly negative impressions of the food, clothing, and medical care received. A more direct complaint I have is with the book's lack of illustrations. Only four photographs grace its pages, and no visual rendering of the camp layout was included. Based on both official documents and unpublished diaries & letters scattered in manuscript repositories around the country, Camp Chase is a well researched and concisely well constructed history of the prison. At less than 150 pages of main text, Pickenpaugh's short manuscript is also a useful reminder that studies can be brief, yet still carry scholarly weight. While not a detailed examination of policymaking on a national level, this book is a very good survey history of the multiple wartime roles of the Camp Chase facility, and a worthy contribution to the literature of Civil War prisons. Interesting entry from the Fine Books Blog, asking "Who Owns Your Advance Reading Copies?". The idea of publishers (S&S in this case) sending unsolicited galleys to reviewers, while at the same time asserting a right to consider it a loan subject to recall at any time, is pure silliness. Putting that specific issue aside, while I understand some fiction ARCs can carry some real value, I can't imagine anyone wanting to actually purchase a non-fiction Civil War galley (at least the vast majority of the ones I've seen) anyway. Driscoll: " The Civil War on Pensacola Bay, 1861–1862"
While the dramatic saga of Fort Sumter has been re-told many times in the Civil War literature [most recently by David Detzer's Allegiance: Fort Sumter, Charleston, and the Beginning of the Civil War (2001), and slightly earlier, but perhaps best of all, by Maury Klein's Days of Defiance: Sumter, Secession, and the Coming of the Civil War (1997)], that of Fort Pickens has received only a fraction of the public and publishing attention accorded to Sumter. At the time, both places certainly weighed heavily upon the minds of the leadership atop the U.S. and the Confederate governments. It has often been said that either fort could have provided the spark that would lead to civil war, but it is difficult to deny the greater symbolic power of Sumter. Unlike Charleston's harbor fort, Pensacola and Pickens were not nestled directly against the most fevered bosom of secession, and the Florida bay was relatively isolated. Nevertheless, saving Fort Pickens was critically important to President Lincoln's determination to uphold his stated oath to protect and maintain all federal military installations remaining in U.S. hands. With his book The Civil War on Pensacola Bay, John K. Driscoll has penned the first complete history of Pickens' role in the secession crisis and in the early months of civil war. Centering on the alternating boldness and indecision of the 'men on the scene', Driscoll's narrative radiates an air of immediacy and contingency, yet it never fails to connect these local events with the other heated national crises that erupted between the U.S. and Confederate governments. The author does well to link the fates of Sumter and Pickens, and astutely analyzes the military opportunities gained or lost by the reluctance from both sides to instigate formal hostilities. Driscoll creates balanced portraits of the many army and navy officers involved from both sides1, and is appropriately critical of the often disjointed efforts of Lincoln and his cabinet, many of whom operated at cross purposes through improper channels. Driscoll's manuscript makes good use of archival and other primary source materials; and the author's fine narrative and analytical skills are augmented by detailed notes. The book's relatively short page length masks its true size, as the text's small print is packed densely on the pages. That's not to say The Civil War on Pensacola Bay lacks illustrations. Dozens of well chosen photographs, both period and modern, are included. On the other hand, I would like to have seen more maps beyond a single archival reproduction of opposing battery locations and ranges. A tactical map of the October 9, 1861 Battle of Santa Rosa Island2 was especially needed. However, the most significant lament is with the copy editing. The number of typos is surprising, given the usual fine work by the publisher in this regard. However, in the final estimation, this book's abundant positives far outweigh its weaknesses. John K. Driscoll has provided us with an excellent scholarly work that is easily the best history of the military and political crisis over Fort Pickens to date. This well written, fully documented, and richly informative account is highly recommended3. 1 - Men like US army officers Adam Slemmer, Jeremiah Gilman, Israel Vogdes, Montgomery Meigs, and Harvey Brown; the USN's Henry Adams and David Porter; and the CSA's William Chase, Braxton Bragg, and Richard Anderson. 2 - This battle, an unsuccessful Confederate attempt to capture Fort Pickens from the east, is well documented in Chapter 10. Interestingly, the officers (James Chalmers, John K. Jackson, and J. Patton Anderson) leading the three small battalions, headed overall by Richard Anderson, were all prominent brigade commanders during the Battle of Shiloh six months later. 3 - My year in review post lists The Civil War in Pensacola Bay as the best naval history of 2007. Fortunately, each passing year brings more than enough solid, scholarly historical works to make the Civil War reading experience a positive one overall. Reflecting on the past 12+ months or so, I've assembled a number of personalized book and publisher "bests". Of course, the amount of time does not exist that would allow me to read every worthwhile 2007 book across all genres; thus, I will only be writing about books I've actually read from cover to cover. Obviously, this list reflects my own selective bias of interest, so take it as you will. Best Publisher (Private): Savas-Beatie - While there's certainly room for improvement in some areas, this publisher demonstrates a consistent ability to acquire some of the most fascinating, original manuscripts and at the same time allow the authors expansive freedom. S-B also maintains a sincere desire to go the extra mile in providing critically important aspects of presentation largely ignored or skimped upon by others (e.g. maps - thanks to Karen O. and the rest of the Yeah, Yeah, Yeahs for agreeing with me). Runner up: McFarland. Keep An Eye Out For: Westholme - Already tops in terms of editing and overall scholarly presentation, I look forward to seeing more Civil War-related publishing from them, and am particularly interested in finding out how they would handle a campaign or battle history. Best Publisher (University): Tennessee - Though hardly obscure in their previous offerings, I appreciate Tennessee's expanding contributions to first-rate Civil War and regional publishing across the board (from original manuscripts to edited documents, essay collections, reprints, tour guides, etc.). See the Voices of the Civil War and the new Western Theater in the Civil War series. Honorable mentions to: Nebraska and University of Alabama Press. Best Self-Publishing Effort: Dale Cox - for his books The Battle of Natural Bridge, Florida: The Confederate Defense of Tallahassee and The Battle of Marianna, Florida . Best Social-Political History: The Road to Disunion, Volume II: Secessionists Triumphant 1854-1861 by William Freehling (Oxford); honorable mention to Nelson Lankford's Cry Havoc! : The Crooked Road to Civil War, 1861 (Viking). Best Campaign History: Shenandoah Summer: The 1864 Valley Campaign by Scott Patchan (Nebraska). Best Tour Guide: Wilson's Creek, Pea Ridge, and Prairie Grove: A Battlefield Guide, with a Section on Wire Road by Hess, Shea, Piston, and Hatcher (Bison/Nebraska). Best Naval History: Civil War on Pensacola Bay, 1861-1862 by John K. Driscoll (McFarland). Best Work of Analysis: Army of the Potomac: McClellan's First Campaign, March - May 1862 by Russel Beatie (Savas-Beatie). See also, Trench Warfare under Grant and Lee: Field Fortifications in the Overland Campaign by Earl Hess (North Carolina). Best Edited Collection: “The Earth Reeled and Trees Trembled”: Civil War Arkansas, 1863-1864 ed. by Mark Christ (Old State House Museum). Runner up, Little to Eat and Thin Mud to Drink: Letters, Diaries, and Memoirs from the Red River Campaigns, 1863-1864 ed. by Gary Joiner et al (Tennessee). Best Reference Work: Guerrilla Warfare in Civil War Missouri, 1863 by Bruce Nichols (McFarland). See also, Bob Krick's Civil War Weather in Virginia (Alabama). Best Local/Regional History: Earthen Walls, Iron Men: Fort DeRussy, Louisiana, and the Defense of Red River by Steven Mayeux (Tennessee). The mission of the Center for the Study of the Civil War in the West is to establish Western Kentucky University as the world’s premier institution for research, teaching, and public dialogue on the history, culture, and contemporary implications of how the Civil War was experienced by Americans living west of the Appalachian Mountains. The Center is WKU’s primary vehicle to promote initiatives in scholarship and regional service. No publications as of yet, but I've certainly bookmarked the page for future reference. Thanks to author Joseph Reinhart for the tip. Fort Anderson: Battle for Wilmington by Chris E. Fonvielle, Jr. (Da Capo, 1999). Anyone who loves maps shouldn't miss picking up this oversize paperback volume; another great book by Fonvielle. The first edition of this book was published by Savas Publishing (1999, a secondary listing I read mentioned a single 500 copy print run). 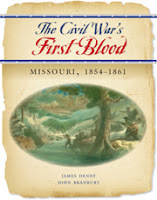 The Civil War's First Blood: Missouri, 1854-1861 by James Denny and John Bradbury (Missouri Life, 2007). Distributed by University of Missouri Press for Missouri Life magazine, this heavily illustrated book looks to be a reasonably good introductory history of the period. Divided Allegiances: Bertie County during the Civil War by Gerald W. Thomas (North Carolina Division of Archives and History, 1996). This is the only completely blind acquisition of the bunch. Bertie county is located just west of Plymouth, so it presumably hosted more than its share of Civil War events in NC. Action Before Westport 1864 by Howard N. Monnett (University Press of Colorado, 1995 revised edition). New introduction by John M. Monnett, with revised annotation. Prices for the hardcover first edition (Westport Historical Society, 1964) have really come down since the late 1990s when they were all triple digits. Though dated, Monnett's book is still the best one volume history of the campaign [this situation is expected to change with Sinisi's upcoming book]. While not a complete overhaul by any means, John Monnett's corrective notes make this new edition an attractive acquisition. Confederate Cavalry West of the River by Stephen B. Oates (University of Texas Press, 1992 PB-reprint). This is another dated classic that nevertheless contains some useful information, in this case mainly in the tables and appendices. Carpenter: "A Slight Demonstration: Decatur, October 1864, Clumsy Beginning of Gen. John B. Hood's Tennessee Campaign"
The four day investment of Decatur, Alabama has merited little more than a brief mention in most histories of the Fall 1864 Tennessee campaign. With General Hood seeking a suitable crossing point1 over the Tennessee River for a strike at Stevenson, Decatur was a secondary option. Unfortunately for the Confederates, the farther west the Army of Tennessee traveled in the quest for a crossing the more time and distance factors conspired against Hood's original plan of breaking Union rail communications near Stevenson and advancing into middle Tennessee along the Chattanooga-Nashville axis. According to A Slight Demonstration author Noel Carpenter, the failure to quickly secure Decatur seriously damaged Confederate opportunities for success in Tennessee against the temporarily scattered Federal garrisons. In addition to forcing the consumption of critically low supply reserves, the delay also led the Confederate army to take up the direct path to Nashville. This circumstance yielded to the federal army the direct supply and communications conduit between Sherman's army in Georgia and the Tennessee capital2. The federal defense of Decatur was a textbook example of a successful defense of a fortified post against a vastly superior attacking force. While overall commander BG Robert S. Granger is criticized for his inability to grasp the strategic situation, post commander Col. Charles Doolittle is praised. Doolittle's mobile forward defense strategy, in combination with his well timed and organized sorties, inflicted serious losses on the Confederate skirmish lines and disrupted their artillery emplacements. In addition, the federals made far better use of their own artillery. John Bell Hood and his subordinates are rightly criticized for the carelessness of their forward deployments3. Patrick Cleburne failed to monitor his left flank near the river, allowing nearly the entire skirmish line on the Confederate left flank to be gobbled up by a brilliantly planned and executed sortie by the Union defenders. The Confederates badly mismanaged their artillery deployments across the board. Careless planning by A.P. Stewart on Hood's right allowed another Federal thrust to wreck a multi-battery earthwork aimed at interdicting shipping and breaking up the Union pontoon bridge. The bridge's continued operation allowed the garrison to increase its strength from that of a small brigade to around 5,000 men over the course of the demonstration. Utilizing a suitable array of published and unpublished sources, Carpenter's narrative is a well written one, and his concise chronicling of the operational movements of the opposing forces sets up well his detailed depiction of the tactical situation at Decatur. The author's clear reconstructions of the Confederate approaches and Federal countermeasures, frequently detailed at regimental level, are exemplary. My only complaint is the dearth of maps. There are only two, a strategic overview and an endpaper map of the Decatur defenses reproduced from the O.R. atlas. Additional maps would have been very helpful in clarifying troop positions and movements. 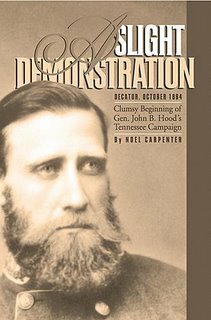 In the end, Noel Carpenter's A Slight Demonstration makes a strong case for the reexamination of the opening moves of Hood's 1864 Tennessee campaign, and their importance in determining how the campaign would ultimately be conducted. This compact volume well deserves a prominent place in the library of standard histories dealing with this campaign. 1 - As an appendix, Carpenter includes a very informative table of Tennessee River fords and ferries located between Chattanooga, TN and Florence, AL. Names, locations, brief assessments of the character and condition of the crossings, and other remarks are detailed. 2 - In hindsight, this doesn't appear critically important, but Beauregard, Hood, and the rest of the Confederate high command believed so at the time. 3 - Concurring with the opinion of most current researchers, the author found no evidence to believe any of Hood's failures before or during the Decatur operation were laudanum-induced. $32.10 includes book rate postage. It is also available at: Parham's Civil War Relics, 723 Bank Street, Decatur, AL 35601.